Winners have been announced at this year’s ResilientCity.org Design Ideas Competition. Of the twenty finalist entries, the concept “Living with the Water Paradox” by Nok Ratanavong, Sang Ok Kim, and James Kim was selected as the First-Place winner. Winner of the special prize for Best Insights was the proposal “full of fuel”, and two Honourable Mentions were given to “Manifestations for a City” and “FIH in Fairview Mall”. The 2010 ResilientCity.org Design Ideas Competition invited architects, city planners, urban designers, engineers, landscape architects, and students of these fields to contribute their ideas about creating more resilient cities as we move into a century where cities will be subjected to the combined environmental and economic impacts of climate change and energy transition. After extensive deliberation of the 20 finalist entries in this years’ ResilientCity.org Design Ideas Competition, Living with the Water Paradox proposal by Nok Ratanavong, Sang Ok Kim, and James Kim was selected as the winner. The Jury was of the opinion that this entry was the most effective at integrating the key principles of urban resilience into a compelling vision for how to increase the resilience of the Fish Market and surrounding area in Sydney, Australia. Although many of the entries provided important insights and developed thoughtful ideas for increasing urban resilience, Living with the Water Paradox stood out both for its understanding of how to build resilience, and for its imaginative application of resilient planning and design principles to addressing the wider implications of Australia’s deepening ecological crisis. Typical view of the ‘front yard farm’ streets and the aqua culture farms behind in the bay. The Jury was impressed by many of the key insights contained in the proposal. Chief among them was its synthesis of potential planning and design responses to the threats posed by climate change, especially flooding and drought. There have already been significant water rationing and flood events in Australia, and these disturbances are only expected to worsen in frequency and intensity as climate change progresses. Typical street with 2 vehicular lanes and promoting environmentally friendly transportation modes, such as bus, cycling and walking and buildings, some with solar panels for energy generation and which uses building construction methods that are climate efficient to use less energy within homes. Jury moderator Craig Applegath commented that the winning proposal is effective because it uses the issue of water as a starting point to grapple with the larger issues of urban resilience. “It works because it considers how disturbances to the water system will ripple throughout the city, and what can be done to prepare the city’s functions to cope with those shocks and stresses,” he said. The proposal’s defining feature is a comprehensive, district-scale system of interventions that link water to waste, food, and energy. 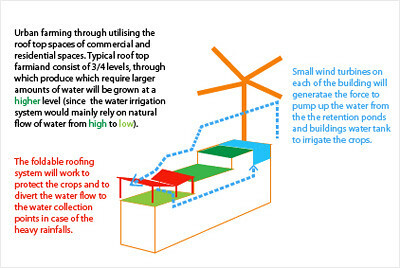 The system responds to the higher risk of storm surges by harvesting rainwater and surface runoff. As part of the proposed strategy, rain water is used in conjunction with desalinated water to support local decentralized food production in front yard and rooftop gardens, and for water features that enhance the appearance and function of public spaces. “As desertification continues to move into Australia’s wheat belt, this entry’s proposal to give people options for eating directly from urban plots becomes both more pressing and more attractive,” said jury member Peter Howard. The proposal calls for urban farming research into drought and flood resistant plants and growing methods through community-owned cooperatives. Waste food is returned to food production as compost, while waste methane is used to generate electricity. In order to reduce carbon dependency and prepare for a post-carbon future, electrical power supply is further augmented by micro-hydro stations as well as by small-scale solar and wind installations that support desalination, food and aquaculture production, and waste processing. “This proposal is successful in part because it breaks with the tendency to see core functions at purely the city or regional scale,” said jury member Michael Haggerty. The jury agreed that decentralized and redundant micro facilities are likely to increase the capacity for resilience because they can help to reduce incidences of cascading failures, would not require large investments of capital or an aggregation of new resources or technologies, and carry the added benefit of being easier to maintain. While the Jury felt the proposal would have benefited from a closer examination of the strategies that could be used for adapting to other key threats, such as the rising sea level and an increase in the number and intensity of bushfires, it concluded that Living with the Water Paradox was overall the most integrated approach to building resilience as well as the most illustrative of the complexity that is emblematic of this competition. See the complete proposal on ResilientCity.org.